Androgen-deprivation therapy effect on benign prostatic tissue. Compared with conservative management, primary androgen-deprivation therapy is not associated with improved survival in the majority of men aged 66 years or older with clinically localized prostate cancer. Neoadjuvant hormonal therapy before radical prostatectomy has not been shown to be effective. Grading of hormonal treatment effects (regression grading) to predict clinical outcome has been attempted but has yielded variable results. This is not routinely performed, and special studies on prostatic carcinoma with treatment effect are not currently done. Endocrine therapy for prostate cancer is viewed as palliative and not curative, although most patients do experience an objective response. Eventually, all patients with metastatic disease treated with hormonal therapy develop hormone-independent (hormone-refractory or hormone-resistant) prostate cancer, with a rising prostate-specific antigen (PSA) level or other evidence of progression in the presence of androgen blockade. Androgen-deprivation therapy effects may be seen in prostatic tissue from needle biopsy, transurethral resection of the prostate (TURP), and radical prostatectomy. 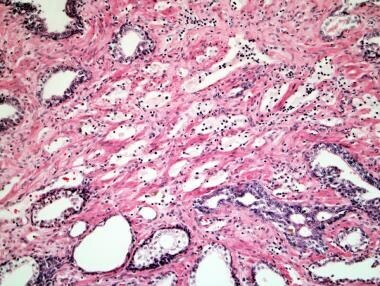 These effects can also be found in tissue samples of metastatic prostatic carcinoma. When evaluating the effects of androgen-deprivation therapy on prostatic tissue, also consider the possibility of benign conditions that may mimic carcinoma following such therapy, such as benign atrophy and histiocytic infiltration. The gross findings and microscopic effects of hormonal therapy on prostatic tissue and prostate cancer are briefly reviewed in this section. Androgen-deprivation therapy effect on a nodule in benign prostatic hypertrophy. There is a decrease in the tumor volume and number of malignant glands in adenocarcinoma. In a small percentage of patients treated with neoadjuvant hormonal therapy before radical prostatectomy, no residual tumor is identified. 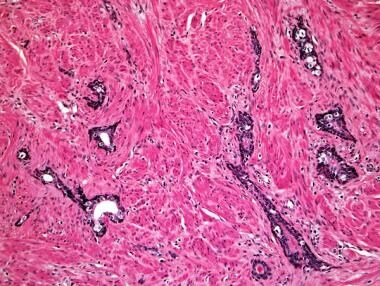 A decrease in size of the adenocarcinoma glands is characteristic, with small and atrophic glands being detected. Loss or collapse of luminal spaces is typical. 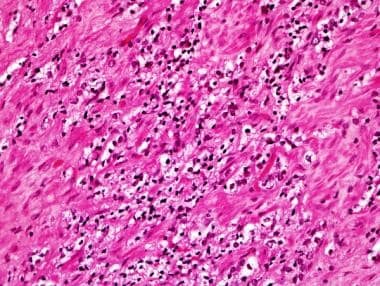 A particularly insidious pattern of growth that can be difficult to recognize as malignant is the presence of widely scattered single tumor cells embedded in a wide expanse of stroma. 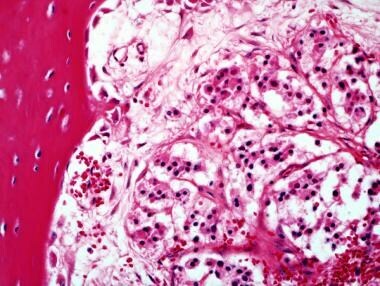 A branching pattern and mucinous spaces and clefts (so-called pseudomyxoma ovarii-like pattern) may be seen. Cytologically, the carcinoma cells classically show nuclear pyknosis, hyperchromasia, inconspicuous nucleoli, cytoplasmic clearing, and cytoplasmic vacuolization. These changes can impart a histiocytoid appearance to the tumor cells. 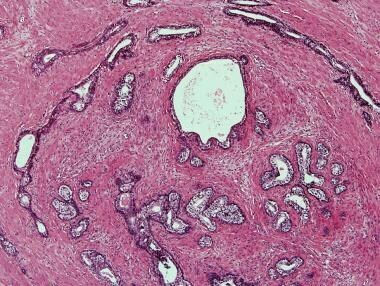 The stroma may be inflamed and edematous, fibrotic, hyalinized, and sclerotic. There is no change in high–molecular-weight cytokeratin expression in basal cells, so this marker still has diagnostic value in difficult-to-diagnose cases following hormonal therapy. Hormonal therapy has been associated, in rare cases, with the emergence (or selection and progression) of prostatic carcinoma variants, including small cell carcinoma, sarcomatoid carcinoma, and squamous cell carcinoma. Images of hormonal therapy effects on prostate cancer are provided below. Androgen-deprivation therapy effect on prostatic carcinoma. Androgen-deprivation therapy effect on prostatic carcinoma: mucin pools without residual carcinoma cells. Androgen-deprivation therapy effect on prostatic carcinoma: subtle, single-cell infiltrate. Diagnostic recognition of carcinoma cells with hormonal treatment effects that are outside the prostate and in metastatic sites may be difficult (see the image below). Immunohistochemical stains can be of utility in these settings, and they can facilitate a more accurate stage assignment. Androgen-deprivation therapy effect on metastatic prostatic carcinoma in bone marrow. 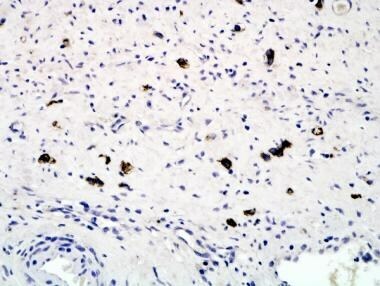 Immunohistochemical stains for basal cells and alpha-methylacyl-coenzyme A (CoA) racemase (AMACR) can be helpful in the diagnosis of prostatic carcinoma after hormonal treatment. [16, 17, 18] There is a reduction in AMACR immunoreactivity following hormonal therapy, such that 45% to 71% of cases are AMACR positive. [16, 18] In these post–hormonal therapy, AMACR-negative cases, basal cell stains assume great importance. In radical prostatectomy cases with neoadjuvant hormonal treatment, detection of single-cell carcinoma infiltrates (see the image below) and distinction of carcinoma cells with treatment effect from inflammatory cells such as histiocytes and lymphocytes may be facilitated by the use of pan-cytokeratin, prostate-specific antigen (PSA), prostate-specific acid phosphatase (PSAP), and prostate-specific membrane antigen (PSMA) immunostains. [11, 19] PSA and PSAP expression may be reduced after hormonal therapy, whereas cytokeratin expression is unaltered. 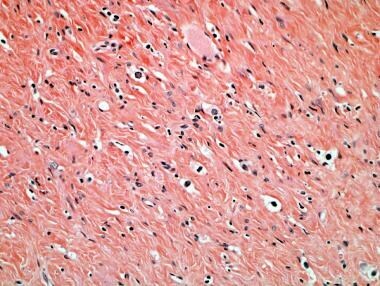 Cytokeratin immunostain, with detection of single-cell carcinoma infiltrate, following hormonal therapy. Unlike breast carcinoma in which immunostains for estrogen and progesterone receptors are useful in predicting response to hormonal therapy, androgen-receptor immunohistochemistry has no value in predicting response to hormonal therapy for patients with untreated prostatic adenocarcinoma. Nelson JB. Hormone therapy for prostate cancer. Wein AJ, Kavoussi LR, Novick AC, et al, eds. Campbell-Walsh Urology. 9th ed. Philadelphia, Pa: Saunders-Elsevier; 2007. 3082-3100. Thompson IM, Goodman PJ, Tangen CM, et al. The influence of finasteride on the development of prostate cancer. N Engl J Med. 2003 Jul 17. 349(3):215-24. [Medline]. [Full Text]. Armas OA, Aprikian AG, Melamed J, et al. Clinical and pathobiological effects of neoadjuvant total androgen ablation therapy on clinically localized prostatic adenocarcinoma. Am J Surg Pathol. 1994 Oct. 18(10):979-91. [Medline]. Cher ML, Bova GS, Moore DH, et al. Genetic alterations in untreated metastases and androgen-independent prostate cancer detected by comparative genomic hybridization and allelotyping. Cancer Res. 1996 Jul 1. 56(13):3091-102. [Medline]. [Full Text]. Best CJ, Gillespie JW, Yi Y, et al. Molecular alterations in primary prostate cancer after androgen ablation therapy. Clin Cancer Res. 2005 Oct 1. 11(19 pt 1):6823-34. [Medline]. [Full Text]. Petraki CD, Sfikas CP. Histopathological changes induced by therapies in the benign prostate and prostate adenocarcinoma. Histol Histopathol. 2007 Jan. 22(1):107-18. [Medline]. Wilcox C, Kautto A, Steigler A, et al. Androgen deprivation therapy for prostate cancer does not increase cardiovascular mortality in the long term. Oncology. 2012. 82(1):56-8. [Medline]. Sevilla C, Maliski SL, Kwan L, et al. Long-term quality of life in disadvantaged men with prostate cancer on androgen-deprivation therapy. 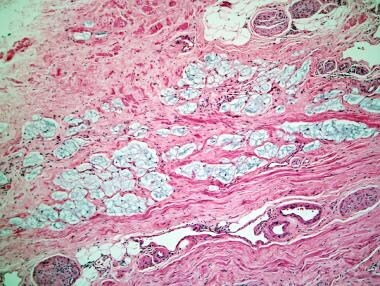 Prostate Cancer Prostatic Dis. 2012 Jan 31. [Medline]. Walker LM, Tran S, Wassersug RJ, et al. Patients and partners lack knowledge of androgen deprivation therapy side effects. Urol Oncol. 2012 Jan 25. [Medline]. Reuter VE. Pathological changes in benign and malignant prostatic tissue following androgen deprivation therapy. Urology. 1997 Mar. 49(3A suppl):16-22. [Medline]. Bostwick DG, Meiers I. Diagnosis of prostatic carcinoma after therapy. Arch Pathol Lab Med. 2007 Mar. 131(3):360-71. [Medline]. [Full Text]. Civantos F, Marcial MA, Banks ER, et al. Pathology of androgen deprivation therapy in prostate carcinoma. A comparative study of 173 patients. Cancer. 1995 Apr 1. 75(7):1634-41. [Medline]. Montironi R, Magi-Galluzzi C, Muzzonigro G, Prete E, Polito M, Fabris G. Effects of combination endocrine treatment on normal prostate, prostatic intraepithelial neoplasia, and prostatic adenocarcinoma. J Clin Pathol. 1994 Oct. 47(10):906-13. [Medline]. [Full Text]. Rubin MA, Allory Y, Molinie V, et al. Effects of long-term finasteride treatment on prostate cancer morphology and clinical outcome. Urology. 2005 Nov. 66(5):930-4. [Medline]. Lucia MS, Epstein JI, Goodman PJ, et al. Finasteride and high-grade prostate cancer in the Prostate Cancer Prevention Trial. J Natl Cancer Inst. 2007 Sep 19. 99(18):1375-83. [Medline]. [Full Text]. Suzue K, Montag AG, Tretiakova M, Yang XJ, Sahoo S. Altered expression of alpha-methylacyl-coenzyme A racemase in prostatic adenocarcinoma following hormone therapy. Am J Clin Pathol. 2005 Apr. 123(4):553-61. [Medline]. Tang X, Serizawa A, Tokunaga M, et al. Variation of alpha-methylacyl-CoA racemase expression in prostate adenocarcinoma cases receiving hormonal therapy. Hum Pathol. 2006 Sep. 37(9):1186-92. [Medline]. Sung MT, Jiang Z, Montironi R, MacLennan GT, Mazzucchelli R, Cheng L. Alpha-methylacyl-CoA racemase (P504S)/34betaE12/p63 triple cocktail stain in prostatic adenocarcinoma after hormonal therapy. Hum Pathol. 2007 Feb. 38(2):332-41. [Medline]. Kusumi T, Koie T, Tanaka M, et al. Immunohistochemical detection of carcinoma in radical prostatectomy specimens following hormone therapy. Pathol Int. 2008 Nov. 58(11):687-94. [Medline]. [Full Text]. Wissing MD, De Morrée ES, Dezentjé VO, Buijs JT, De Krijger RR, Smit VT, et al. Nuclear Eg5 (kinesin spindle protein) expression predicts docetaxel response and prostate cancer aggressiveness. Oncotarget. 2014 Sep 15. 5(17):7357-67. [Medline]. [Full Text]. Huang KC, Alshalalfa M, Hegazy SA, Dolph M, Donnelly B, Bismar TA. The prognostic significance of combined ERG and androgen receptor expression in patients with prostate cancer managed by androgen deprivation therapy. Cancer Biol Ther. 2014 Sep. 15(9):1120-8. [Medline]. [Full Text]. Marques RB, Aghai A, de Ridder CM, Stuurman D, Hoeben S, Boer A, et al. High Efficacy of Combination Therapy Using PI3K/AKT Inhibitors with Androgen Deprivation in Prostate Cancer Preclinical Models. Eur Urol. 2014 Sep 11. [Medline].